With work and summer weather, I don’t feel like heating up the kitchen. But I still prefer eating delicious and healthy vegetables at home. So here’s what I’ve been makin’ in minutes – grilled eggplant! 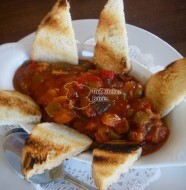 Serve Grilled Eggplant & Tomatoes as an appetizer or side dish. It tastes so good! 1. Line an 18 X 12 baking sheet with parchment paper or aluminum foil. 2. Place some olive oil in a small bowl. 3. With a basting brush, coat the lined baking sheet lightly with oil; set aside. 4. 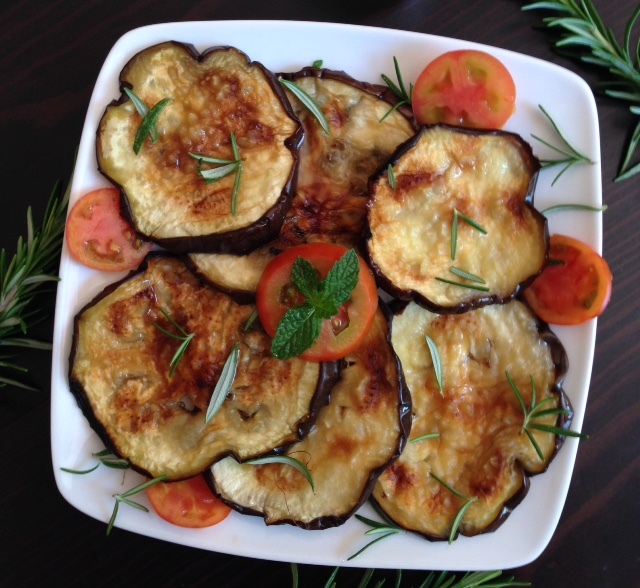 Place the eggplant slices on the oil-coated baking sheet. 5. 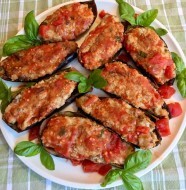 Brush the eggplant slices with olive oil and lightly sprinkle with salt. 6. Transfer the baking sheet with eggplant slices to an oven rack positioned 6 inches from oven’s top broiler element (this is the electric conduit at top of oven that turns red when control knobs are set on “broil”). 7. Broil the eggplant slices for about 7 to 8 minutes per side or until they turn golden brown. 8. Using oven mitts, transfer baking sheet with eggplant slices to a counter. 9. Turn the eggplant slices over. Repeat oil coating and salting directions. 10. Return baking sheet with eggplant to oven rack. 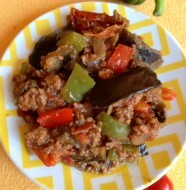 Broil eggplant slices for 7 to 8 minutes or until they are golden brown. 11. Transfer baking sheet with eggplant to a counter. 12. Gently transfer eggplant slices to a serving platter. 13. Cut the cherry tomatoes in half and place them intermittently on top of and around eggplant slices. 14. Lightly sprinkle olive oil over eggplant and tomatoes. 15. Remove rosemary leaves (they are spiky) from stems; garnish eggplant and tomatoes with rosemary leaves. 16.Serve immediately or cover until ready to serve.